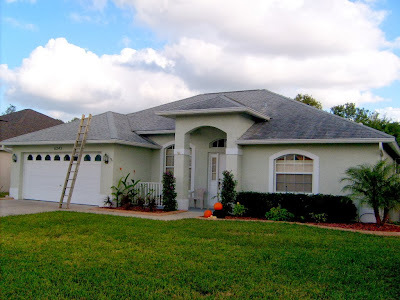 Tampa Roof Cleaning - Ladder Accidents ! Some wanna be Tampa Roof Cleaning outfits are advertising they will clean your roof in Tampa with no walking on it from a ladder. We clean shingle and tile roofs the correct way, by using a man lift if needed. Some advertise "non pressure tampa roof cleaning" then brag about having pumps with 50 foot reach, LOL Sorry, a roof cleaning pump that will "shoot 50 feet" is NOT a non pressure roof cleaning pump! Some of these Tampa Roof Cleaning companies are just plain scared to get on a roof, or don't know how to walk it properly. They attempt to scare you into believing a shingle or tile roof can not be walked on. 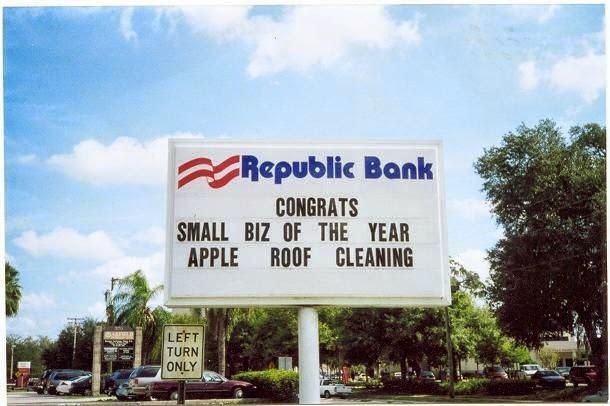 Apple Roof Cleaning of Tampa begs to differ. It is recommended that you step at the bottom three inches of the installed tile. This section is supported by the lapped tile beneath it and the weight is then transferred through it to the deck below. Orient your feet in a horizontal direction. Try to distribute your weight evenly and walk as softly as possible. Valleys are ideal access paths . . .
After a concrete tile roof installation is completed, it is supposed to be walked by a superintendent to be sure that the roofing tiles was properly installed. If repairs are needed, the concrete tile roof must be walked in order to access the affected area. These people are not using helicopters and man lifts. They walk the roof. It is among the occasions when walking the roof is "absolutely necessary". The same holds true for when a home inspector is hired to do an evaluation. Next time you have a leaking roof, ask your Tampa Roofing Contractor to "fix it from a Ladder". It is a fact that most roofing accidents in Tampa are from falls not from roofs, but from Ladders! Lets take a good look at Ladder Accidents ? Here is a jury award for a brain injury from a ladder fall, still want someone cleaning your roof from a ladder ? A New York, NY jury granted $10.7 million to Rupert Natoo, a construction worker who claimed that he sustained a brain injury in a 10-foot fall from a ladder. Natoo alleged that the fall caused brain damage that has caused him to require constant supervision and assistance. Natoo claimed that he now has severe attention, concentration, cognitive function and memory problems. The jury found awarded $10,778,184 to Natoo, plus an additional $300,000 to his wife. Call(813)655-8777 for a free estimate!